On Sunday morning, August 11, we all were transported to Gajuri, Nepal, for worship, celebration and feasting. Laura shared with us her life and experiences over the past year of living and working in a small Nepali village in the foothills of the Himalayas. As we came together for our worship service in Taftsville, we were greeted in Nepali by Laura, wearing her beautiful sari, and instructed (with interpretation) to remove our shoes before entering the chapel. 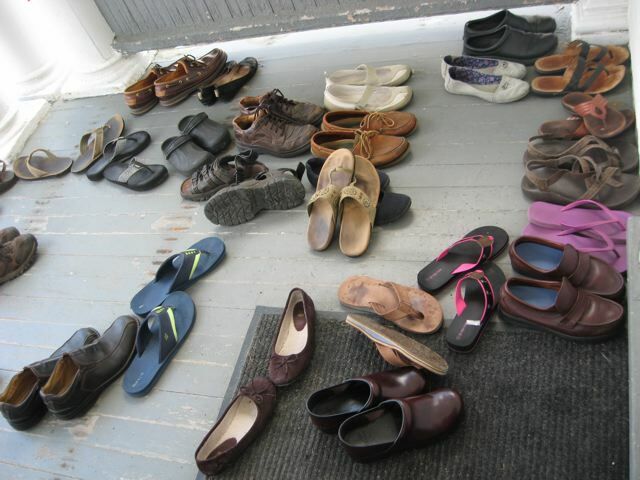 Laura gave Taftsville a little taste of what church in rural Nepal is like—including seating men and women on separate sides and making us take off our shoes at the door! Once inside, we were invited to sit on the floor, and separated, male and female, on either side of the aisle. Laura then treated us to a typical Sunday morning service at her church in Gajuri, filled with singing, dancing, clapping and loud amens. Laura shared with us her personal struggles, and her victories, in the difficult process of adjusting to an entirely different culture and way of life. She had the opportunity to confront fears, and the opportunity to make a difference in others’ lives. She had the opportunity to learn the Nepali language, and the chance to teach a course of English to friends and neighbors. Her faith deepened and she has much to give and to share as she enters her new year as a graduate student in public health at Dartmouth College. Following the worship service, Laura served a tasty Nepali meal of rice, lentils, curried meat and vegetables. Thank you, Laura, for sharing a glimpse of your year with us! We are glad to have you among us once again, and praise God for all he is doing through students like you around the world. As most of you know I was not raised in a Mennonite home. My moral upbringing included many biblical stories, songs, and principles. It also included some not-quite-biblical principals of Yankee stoicism, handwork, pride, honor, and personal dignity. I am a fan of the works of J. D. Salinger (with the exception of Catcher in the Rye, of course). In Seymour: An Introduction there is a description of a birthday party debacle. A younger brother has been given a brand new bike for his birthday. He goes out for a ride and returns home without the bike. He explains, to the horror of his father, that he met a boy who had never had a ride on a bike, so he gave his bike to the boy. “The whole bike to a stranger?” howled the father. “Why not just give him a ride on the bike?” “Because he wanted more than just a ride,” replied the boy. Seymour then proceeds to explain to his father the purity of the religious act that his brother has performed. Face slapping, indentured servitude (commentators suggest that going two miles when asked to go one refers to a custom of Roman occupation wherein a soldier would commandeer a passerby and force him to carry the soldier’s gear for him for a mile), possession abandonment, and birthday bike giving. I am challenged. Surely there must be some boundaries here. What if the hitchhiker doesn’t just want a ride, but wants my car? I all too clearly can envision the expressions on the faces of my parents if they were to read the previous query. But search as I might I can not find the boundaries. At times words of trusted friends seem to enlighten a fuzzy image of a boundary. Further readings of the words of our Lord cause the faint boundaries to summer and disappear. The longer I live in faith the more challenging these verses become. Perhaps I am called to be a doormat after all. The mat that lies before the door. The mat that lies between the dust, dirt, and mud of the raging storms of the world, not completely apart from them or the debris they stir up, but right next to the door, under the overhang, the light from the doorway flooding over me.